The University of Greenwich and a group of LGBT organisation working on asylum-related issues organised, on 5, 6 and 7 July 2010, one of the first international conferences dedicated to the rights of LGBTI asylum seekers. The title chosen by the organisers (“a case of double jeopardy”) refers to the situation of lesbian, gay, bisexual, trans and intersex people in the asylum system: they are fleeing persecution in their country of origin, but also facing discrimination and a low level of sensitiveness to their special needs in the countries where they are seeking safety. An illustration of this double jeopardy, and an encouraging development, came on 7 July, when the British Supreme Court delivered a groundbreaking decision (HT and J v. Secretary of State for the Home Department) on the case of two asylum seekers from Iran and Cameroon. Following this decision, the UK asylum system will now clearly recognise that “what is protected is the applicant's right to live freely and openly as a gay man.” It makes clear that, when there is a fear of persecution, it can’t be considered reasonable to force LGB people to go back to their country of origin under the expectation that they could be “discrete” and conceal their sexual orientation forever. S. Chelvan, the barrister who pleaded HJ and T’s cases, was a member of the conference’s organising team. He delivered a most interesting presentation on the positive consequences of the decision. Following the conference, ILGA-Europe joined the organisers to work on the redaction of a Greenwich Declaration of Human Rights for LGBTI Asylum Seekers, which will include a call for change in asylum systems in Europe and in the world. The conference’s website will soon be reformatted to better disseminate materials and to provide access to a resource base of information: check it out here. “Over Not Out”, a research on housing and homelessness issues specific to LGBT asylum seekers,commissioned by Refugee Support here. “Failing the Grade”, a report on the Home Office’s decisions on LG claims for asylum, published by the UK Lesbian & Gay Immigration Group (UKLGIG). 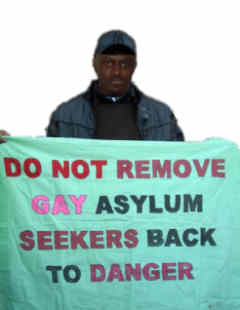 “No Going Back”, a report on LG people and the British asylum system, published by Stonewall.